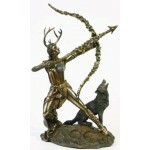 This lovely statue by artist Oberon Zell is cast resin hand finished in blue and silver and is 7 1/2 inches tall. 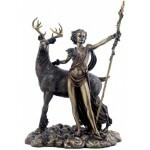 One of the most enduring of the great Classical Goddesses, Diana is the Roman name for the Greek Goddess Artemis. Diana is a lunar divinity dedicated to the waxing crescent. She has many titles: Maiden Huntress, Mistress of the Beasts, Queen of the Night, Lady of the Grove. She is one of the virgin goddesses who was first and foremost a women's goddess. She never married and preferred to roam the woodlands with Her retinue of nymphs and forest creatures. All young animals were sacred to Her as She was their protector. Her favorites were bears, deer, hares, cats, hounds and other animals and birds associated with the Moon. Item Number: MT-DGS | Approximate Size (Inches): 4.00 wide x 7.00 deep x 7.50 high | Approximate Shipping Weight: 2.50 lbs.